This is a very easy walk to follow as it makes few turns and follows major traffic arteries. It is an especially good walk to take in October, as the foliage is very colorful along this route. Some of the areas of interest on this walk are the Lake Newport Recreation Area, Buzz Aldrin Elementary School, Baron Cameron Park, the Reston Dog Park, and Browns Chapel. This path starts from the parking area at the first intersection to the left on Browns Chapel Road coming from Baron Cameron Avenue. Take the pathway along the access road to the west by the tennis courts. Turn right to follow the sidewalk along North Village Road to the next intersection. Cross North Village Road and continue north along that road on the wide asphalt path on the west side of the road. The asphalt path is wider than the sidewalk on the other side of the road although either can be used to reach Center Harbor Road. The path is shown in the vicinity of Newport Cove Lane. The path passes the Lake Newport Recreation Area on the left just prior to the crossing of Lake Newport Road. This is a view of the path north of Lake Newport Road. Notice how it looks like the road is in a forest although there are homes on both sides of the road. The path is shown prior to Turnbridge Lane. At Center Harbor Road turn right and follow the wide asphalt path east along that road. The path is shown after crossing Waterfront Road. The path passes Buzz Aldrin Elementary School on the right. At Wiehle Avenue turn right and follow the wide asphalt path along the west side of that road. If you would like to visit the Reston Dog Park walk through the grove of trees separating the Baron Cameron parking area from Wiehle Avenue just south of the intersection with Longwood Grove Drive. Turn left and walk on the left side of the parking lot for a short distance. 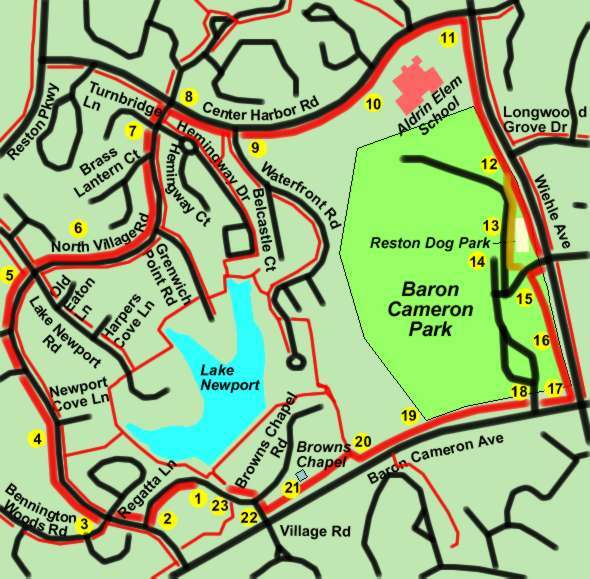 If you are not interested in the Reston Dog Park continue on the trail along Wiehle Avenue to the access road for Baron Cameron Park. After crossing the access road turn right to follow the path for a very short distance until it turns left to continue following Wiehle Avenue. Go to point 15 in the instructions. (Reston Dog Park) The entrance to the Reston Dog Park is on the left. Notice that double gates are provided to prevent escapes. This is a great meeting place for both people and dogs as the pictures show. Click here if you would like to visit their web site. After visiting the dog park continue walking in a southerly direction along the parking lot. Turn left at the access road from Wiehle Avenue and turn right onto the wide asphalt path along the south side of that road. The path passes through shrubbery to continue south along Wiehle Avenue. The path is shown as it continues to follow Wiehle Avenue. Shrubbery separates it from that road in this area. Turn right at Baron Cameron Avenue and follow the wide asphalt path west along that road. The path is shown after crossing the access road to the park from Baron Cameron Avenue. On the right are soccer fields. The path enters a wooded area as it continues to follow Baron Cameron Avenue. Stay on this trail and do not turn left at the trail under Baron Cameron Avenue. The trail turns to the right and crosses a small bridge. After crossing the bridge turn left to continue along Baron Cameron Avenue. The trail passes Browns Chapel. The chapel was moved here in 1968 from its original location at Leesburg Pike and Baron Cameron Avenue. At the next street intersection turn right and cross Browns Chapel Road. Continue on the wide asphalt path as it enters the parking area for the tennis courts and Lake Newport. This completes the walk.